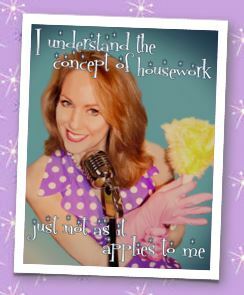 Don’t be fooled by the posters; Pippa Winslow’s new one-woman show is no kitsch, whimsically comic revue of the trials of home management and the difficulty of cleaning behind the fridge. These things are touched upon, but only in passing. The songs she has picked to illustrate her journey are well chosen; some are familiar and some more obscure and all are well performed by both Pippa herself and her delightful pianist Andrew Hopkins. Los Pinguinos, written by Marcy Heisler and Zina Goldrich was most definitely a highlight, sung with the disarming lack of self consciousness which is Pippa’s trademark. She has a keen and sometimes naughty sense of humour and an irreverent view of the world which is infectious. This charm is really what carries the show. There are flaws; the narrative is a little choppy and the tone bounces from comic to tragic and back again with so little warning that we are given no time to readjust and occasionally find ourselves laughing at inappropriate moments. The story rushes along at breakneck speed and some of the themes could have done with a little more development; for example the experience of finding herself a reluctant and entirely unqualified housewife was bubbling with comic potential which was not fully exploited, especially considering the title of the show. The tantalising glimpses we were given were very funny; she describes herself as an “item location specialist” and an expert in cooking with Jell-O. More of those stories please, Pippa! However, Pippa’s warmth and honesty are enchanting; she scoops you up and carries you into her world, giving you the feeling that you are having a chat with an old friend over a cup of coffee and cake. Theatregoers should be very glad that this particular housewife is finally back where she is supposed to be; on the stage.